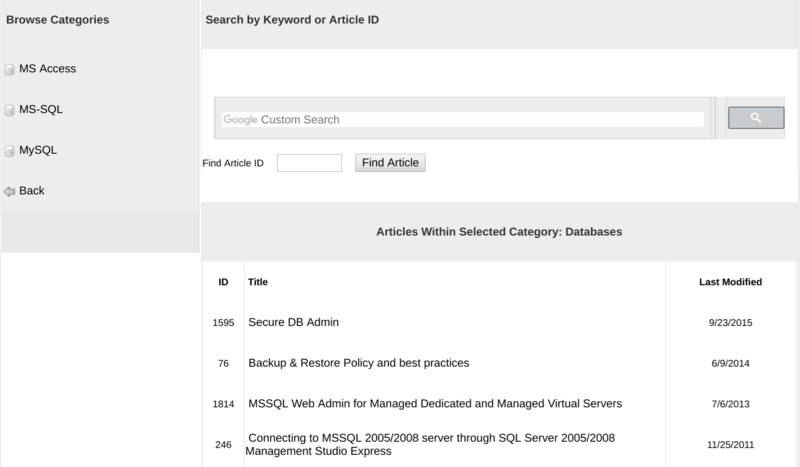 3essentials Review 2019: Is 3essentials a Good Hosting? 3essentials provides shared, VPS, and dedicated server hosting from their data centers spread across the U.S.A. They’ve served over 30,000 customers and offer SSD and SSL with shared hosting. Their website is in English. Founded in 2001, privately owned company 3essentials provides shared Linux and Windows hosting, VPS, and dedicated hosting from its data centers in Texas, Washington, and North Carolina. This provider has served over 30,000 customers including startups, digital agencies, and established businesses. Its website is in English. 3essentials offers a range of hosting products to meet its customers’ needs. These products include WordPress, DotNetNuke, shared Linux, and shared Windows hosting as well as VPS, and (managed) dedicated server hosting. The WordPress hosting packages start with the Micro plan that includes 500 MB of storage for one website, plus unlimited bandwidth, unlimited email accounts, and cPanel. Taking two steps up to the Pro Five plan gives you hosting for unlimited websites, plus unlimited bandwidth, unlimited emails, and 5 GB of SSD storage. Users who want Windows hosting will be pleased to see 3essentials’ support for ASP.NET, DotNetNuke (DNN), and SQL websites. The starter Pro One plan features unlimited bandwidth and email accounts, 1 MS SQL database, 1 MySQL database, and 5GB of SSD storage. Anti-spam email filtering by SpamExperts is available as an add-on to hosting plans. This service blocks 99.98% of all spam, with a false-positive ratio of under one-in-one-million. It works with any email server and protects against spam, viruses, and blacklisting. There is no need to add users to any lists since all operations are performed automatically by the system. For VPS customers, 3essentials offers Linux VPS, Windows VPS, and Windows Desktop VPS hosting. Linux VPS hosting starts out with 1 GB of RAM, 30 GB of SSD storage, and one CPU core. Windows VPS hosting starts with 1 GB of RAM, 40 GB of SSD storage, and one CPU core. Both plans include unlimited bandwidth. 3essentials’ hosting plans are competitively priced compared with national competitors. The basic shared WordPress plan costs less than a cup of coffee per month when you sign up for an annual agreement. The mid-tier and higher tier plans are priced at or below other hosts such as GoDaddy. Put simply, these plans provide good value considering they come with unlimited bandwidth, unlimited email accounts, and SSD storage. Hosting can be bought on a monthly or annual basis, with annual agreements being discounted by 10%-75% depending on the hosting tier. For example, the basic shared WordPress plan is 75% cheaper (pro rata) than the monthly price for the same plan. So, signing up for an annual term may be a no-brainer, especially since the 30-day money-back guarantee should get you out if anything goes wrong within the first month. As if this isn’t enough, there is also a 99.9% uptime guarantee backed by an SLA. Customer services can be contacted by telephone during business hours, and 24/7 support is available via email and live chat. Unfortunately, I received no response when I reached out to sales support. If you have to resort to supporting yourself, you’ll be pleased to see a well-stocked knowledge base and a set of video tutorials. 3essentials offers shared SSD, Linux VPS, Windows VPS, and dedicated server hosting. They operate shared plans on their own dynamic cloud platform. Their servers are housed across the U.S.A. and they offer a 99.9% uptime guarantee as well as a 30-day money back guarantee. Plan prices are competitive. Call to Action: Transfer To Faster Hosting with 3essentials! 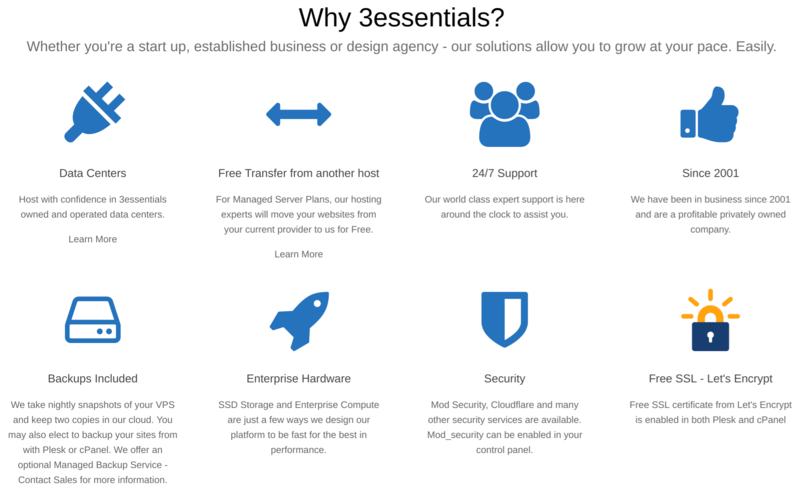 Wondering how 3essentials stacks up against other Web Hosting companies? Enter any other Web Hosting company and we will give you a side-by-side comparison.